Here at our office in Orange, we have the solution for patients who don’t have dental insurance. Our in-office Gold Plan allows you to receive two cleanings per year along with substantial discounts on all dental procedures. All without having to pay a monthly premium to an insurance company! The Gold Plan is not dental insurance. It is not a dental discount plan. It is better than insurance. It is a membership plan giving you affordable access to our office without having to worry about deductibles, annual maximums, waiting periods, exclusions, and all the other gimmicks seen with traditional insurance plans. This Plan is available for both new and existing patients who do not have dental insurance. 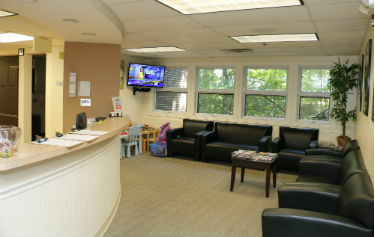 Our spacious Reception Area with plenty of natural lighting. Two cleanings per year – FREE. Two annual check up exams – FREE. Any/all necessary x-rays – FREE. The ability to pick Dr. Nick Calcaterra’s brain at any time – PRICELESS! 15% savings on nearly all needed dental treatment – white fillings, crowns, extractions, root canals, and many other procedures. Do you want to know what is not included in our plan? Waiting periods, annual limits, deductibles, dental claim forms, denials, missing teeth clauses, alternate benefits, and all the other things that insurance companies do to try to get out of covering your dental needs. Dental Implants are covered on this plan! Over the past several years, we’ve heard people say “I wanted to come to see you but I don’t have insurance anymore.” Those same individuals were also frustrated with all the limitations (waiting periods, annual maximums, etc.) with plans offered through various companies. This was creating a real barrier to receiving dental care. 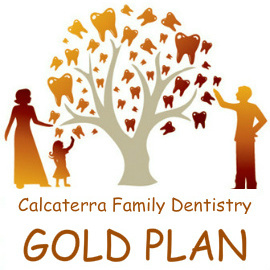 So, we decided to develop a plan that would promote regular dental visits at affordable prices. Regular check-ups allow us to detect problems early – and allow you to avoid more costly procedures such as root canals and dental implants. And thus, the Gold Plan was born, and since the launch in Fenruary 2014 it has been a smashing success! 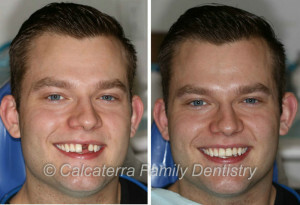 The Calcaterra Family Dentistry Plan is open to new and existing patients who do not have dental insurance. For more information, you can download the forms located here, or you can call us and speak to either Jenn or Sarah.